Conquer new terrain like you've been there before with the Burton Deja Vu Flying V Snowboard. This all mountain shred-machine is perfect for the ladies who are looking to step up their skills in and out of the park. Thanks to the true twin shape, riding switch is a breeze while the Flying V™ rocker profile offers a blend of camber and rocker - that's right, the best of both worlds. Overbite Frostbite edges work for you when the conditions are bulletproof, providing a catch free grip. From peak to park, the Burton Deja Vu Flying V Snowboard is the perfect tool to get your progression on. Flying V™  A blend of camber and rocker performance, Flying V™ offers the best of both worlds. Rocker overall, including between and outside of your feet, enhances playfulness and float. Underneath your feet, subtle camber zones focus edge-control for crisp snap, added pop, and powerful turns. 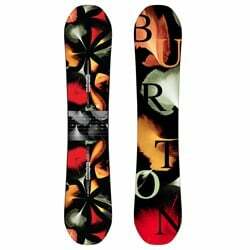 True Twin  A true twin snowboard shape is ideal for riders who want to ride switch and do some tricks. The nose and tail are identical and the flex is evenly distributed throughout the entirety of the board. True twins are perfectly symmetrical. Scoop Pro-Tip™  Burton's Scoop feature combined with Pro-Tip™ achieves a catch-free ride in the park, on the groomers or in the backcountry. This design exaggerates the tip and tail by turning up the edges creating a playful and forgiving ride. Side Effects™  This patented design lengthens the surface area at the tip and tail contact points to improve edge-hold and allow the board to plane easier in pow. 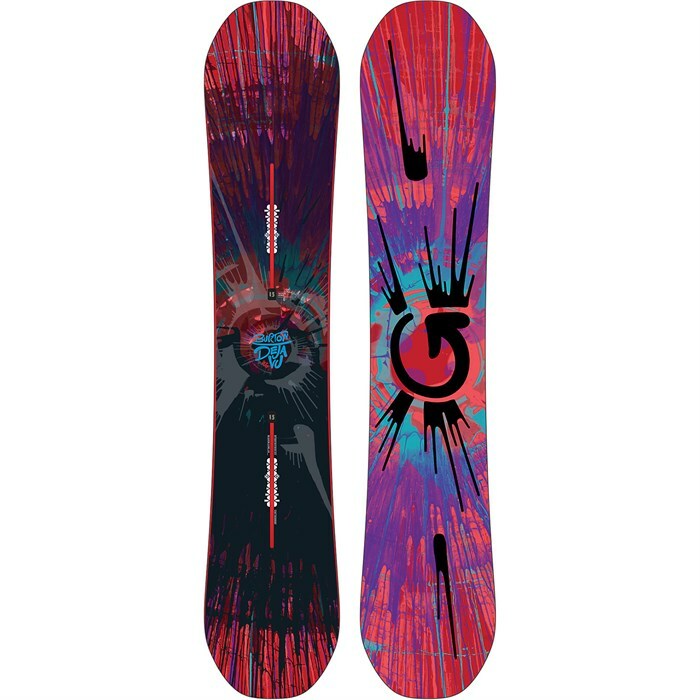 Enjoy a livelier feel and enhanced grip on groomers along with added float for overhead days. Super Fly II™  The Super Fly ll™ core uses stronger and lighter woods in specific areas of the core to provide pop, strength, and reduce weight; creating a further optimized float in Burton's freeride focused boards, and strength in Burton's park-focused boards. Dualzone™ EGD™  The wood grain is positioned along the toe and heel edges on two continuous zones, perpendicular to the rest of the wood core, for consistent edge-hold, and added strength. Squeezebox  Burton's Squeezebox improves your boards performance by balancing thicker more powerful core sections in with thinner more flexible sections. In translation, Squeezebox enhances your connectivity to your snowboard which will create an amazingly stable, responsive and predictable ride. Overbite Frostbite Edges  Burton's revolutionary edge technology; Overbite Frostbite was designed to provide you with heightened edge-hold on all conditions. They are full of power when you need them, but know how to dial back when you're dialing in tricks on boxes and rails. The Channel™  Compatible with all major binding companies. Roc/Cam/Roc/Cam/Roc This is a blend of camber and rocker, for the best of both worlds: rocker overall, including between and outside your feet, enhances playfulness and float. Underneath the bindings there are camber zones for focused edge-control for added pop and power through turns.